Some recent questions regarding sowing grass seed during the winter to an existing horse paddock. Question – Is it too late to sow grass seed on to an existing horse paddock; if not what seed would you recommend? Question – Hi thank you for your reply can you confirm that the grass seed you recommend can be sown at this time of year, thanks? Answer – There is nothing stopping you sowing grass seed during winter but seeds need two main things to germinate – warmth and moisture. It would be fair to assume that there is plenty of moisture around at the moment. However, the soil temperature is reasonably cold. So chances of a successful sowing are very low. The most favourable times of year for sowing is Spring (mid-March until April are usually the best times), and late summer (September-October). I hope this helps. Question – Hi, my label is damaged and i can’t read what dilution I need for my “Vitax Green Up, Lawn Weed and Feed” please could you just e-mail it to me, Thanks? Do not mow for 3 days before and 3 days after treatment to allow full uptake and movement within the weeds. Do not spray on laws which are less than one year old. Allow at least six weeks between treatment and over-seeding established turf. Do not treat during drought, freezing conditions or in periods of prolonged cold weather. Allow at least six months before sowing or planting broad-leaved plants. To treat 12 meter sq. use 2 measures (60ml) in 6 litres of water when using a watering can with a fine rose or sprinkler bar, or 60ml in 1 litre of water when applying by sprayer. Set the sprayer nozzle to a medium setting. Avoid too fine a spray as drift onto neighbouring plants may occur. 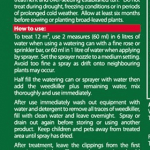 Half fill the watering can or sprayer with water then add the weedkiller plus remaining water, mix thoroughly and use immediately. After use immediately wash out equipment with water and detergent to remove all traces of weedkiller, fill with clean water and leave overnight. Spray or drain out again before storing or using another product. Keep children and pets away from treated area until spray has dried. After treatment leave the clippings from the first mowing on the lawn. The next three mowings should be composted well, for at least 9 months before being used as a mulch. Do not dispose of the grass clippings via council composting schemes. Question – Hi, I live in the Philippines and need to find a suitable grass seed to cover approximately 2000 Sq. Meters of well drained land. It needs to be able to withstand tropical conditions and does not have to be of a fine type (a rough coarse variety is OK). What is common here is referred to as carabao grass but its not available here in seed form so we plan to have it sent from the UK to here. Please advise the most cost effective type that you have.